The Radeon HD 3870 X2’s bridge chip was limited to PCI-Express 1.1, meaning data transfer rates between each GPU—and the PCI-Express x16 interconnect—was limited to just 2.5GB/sec via the bridge chip and a further 0.9GB/sec via the CrossFire interface. 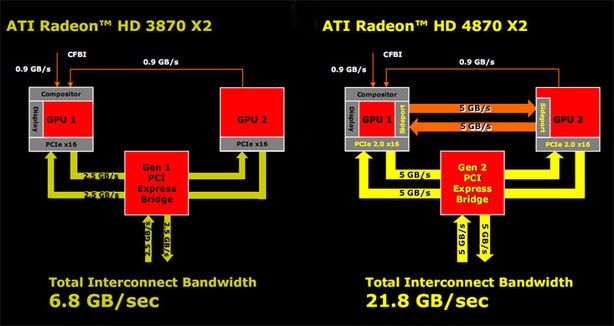 This means that the maximum interconnect bandwidth on the Radeon HD 3870 X2 is 6.8GB/sec. On occasion, AMD believes this lack of bandwidth contributed to some of the performance problems and so the company hopes to resolve this with some additional logic inside the GPU. With RV670, you could say that the 3870 X2 was a bit of an afterthought (from a design perspective), but with RV770, the 4870 X2 was a big part of the design process right from the start. With that in mind, AMD felt there was a need for more bandwidth and so invented an additional interconnect path between the two GPUs. AMD calls this technology Sideport and it’s basically a direct 5GB/sec (bidirectional) highway that bypasses the PCI-Express 2.0 bridge chip. AMD has improved the inter-GPU bandwidth with Sideport technology, but it is currently disabled and may never see the light of day. In many ways, it’s similar to PCI-Express technology but because it’s only designed as a communication path between two AMD/ATI GPUs, the design is a lot more streamlined. What’s interesting though is that we’re unable to see whether Sideport makes a great deal of difference because AMD has chosen not to enable the technology in the drivers at this time – it’s as if the company’s holding something back for a rainy day. When we asked why Sideport was disabled, we were told that there was virtually no difference in performance (in current games at least) between it being enabled and not. We were given hints a long time ago—as far back as the RV670 launch—about how ‘great’ the multi-GPU technology implementation would be on R700, but speaking frankly, there’s not a whole lot of difference between R700 and R680 in terms of technology. Being so broad would be irresponsible though, because one area where changes have been made is in the PCI-Express switch. AMD said it has worked with PLX to make some refinements to this bridge chip to further improve performance in scenarios where bandwidth (and/or scaling) is an issue. The biggest change, aside from the interface speed double up is the introduction of a broadcast write function. This essentially allows the bridge chip to conserve bandwidth by ‘broadcasting’ data to both of the card’s GPUs simultaneously. While I’m sure this does go some way to improving performance in these scenarios, it doesn’t get rid of the biggest problem with CrossFire (and SLI for that matter): drivers. Current multi-GPU technology puts an incredible amount of faith in both company’s driver teams because each and every game has its own ‘optimised’ performance profile – providing the driver team has created one for all those new releases (and obscure titles) that you love to play. In scenarios where there isn’t a profile for a game—or scaling in a particular title is generally poor—you’re greeted with similar performance to just one of the GPUs, and at best it's maybe a few percent faster. In the really bad situations, you could find yourself suffering from negative scaling and that’s not exactly good when you’re spending this kind of money on a graphics card – well, it’s not an ideal situation to be in whatever amount you’ve spent. This is the problem with current multi-GPU setups and until it’s alleviated with technology that’s completely transparent to the drivers, it’ll continue to be something to consider when you’re purchasing something like the Radeon HD 4870 X2. I spent a lot longer discussing this during my original Radeon HD 3870 X2 review and I have to say not a lot has changed with AMD’s latest graphics card. What's the Fastest Current Graphics Card? With a new generation of DirectX 11 graphics cards just around the corner, we take a look at the fastest cards currently on the market to decide which card from this generation has emerged victorious. Hold onto your shaders - this one's going to be bumpy! Finally, an arftermarket cooler capable of taming the raging temperatures of the Radeon HD 4870 X2. We take a look at Arctic Cooling's new VGA cooler to see if the performance is good enough to justify tinkering with your high-end graphics card.